Pipeline opposition and challenges continue, despite FERC’s October 13, 2017, rubber stamp approval of the Atlantic Coast and Mountain Valley Pipelines, issued with a highly unusual dissenting opinion by Commissioner Cheryl A. LaFleur. The FERC permit is not the final word on the projects. VA, NC and WV must still issue environmental permits. The NC Department of Environmental Quality recently declined to issue water quality, soil erosion control permits for the project, requesting additional information from the pipeline. The WV Department of Environmental Protection recently vacated and remanded their water quality certification, saying they want to reevaluate the complete application. The VA Department of Environmental Quality has yet to make a decision, and will hold public hearings in December. Citizens still have the opportunity (and the responsibility) to express their concerns to DEQ (and may sign a petition to protect Virginia waters here). 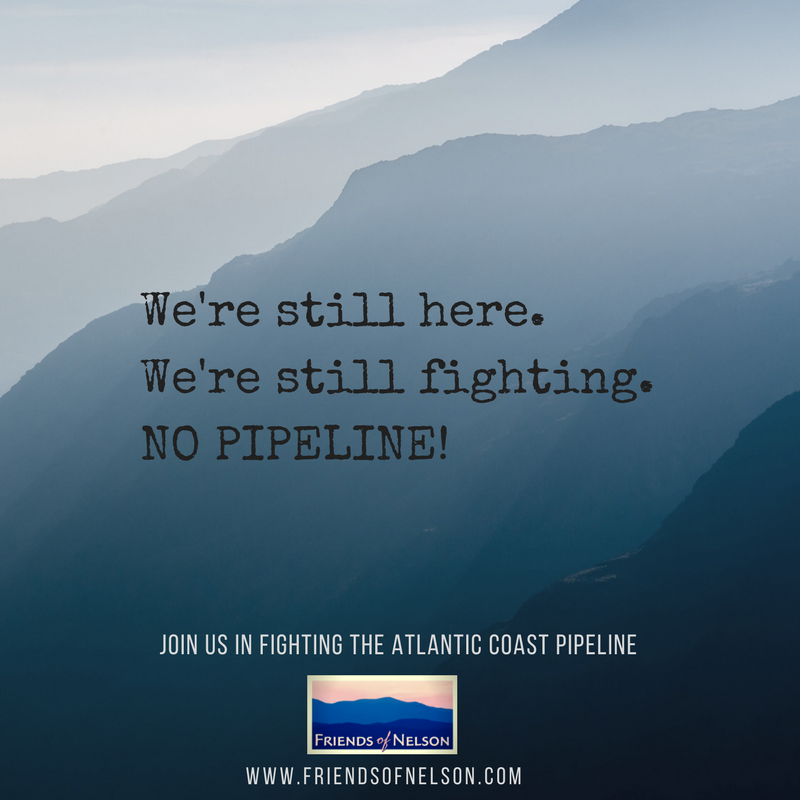 The Wild Virginia Web page has concrete suggestions on how you can continue the fight against the Atlantic Coast and Mountain Valley Pipelines. Greg Buppert, a senior attorney for the Southern Environmental Law Center, called the FERC order a long-anticipated “rubber stamp” and said his organization intends to challenge the decision. “The utilities involved in the construction of the Atlantic Coast Pipeline claim utility customers will save money, when in fact this pipeline will drive up ratepayers’ bills – and cause harm to national forests and to rivers and streams while threatening to commit our states to fossil fuels for decades to come,” he says. Bold Alliance and more than 50 landowners, have a federal lawsuit challenging the use of eminent domain for private gain and intend to continue the fight for property rights in the court system. Yes, we are all still here, and the fight goes on! This entry was posted in Certificates of Approval, Court cases, DEQ, FERC, Take Action, Virginia government, Water Quality on October 15, 2017 by Ellen Bouton.